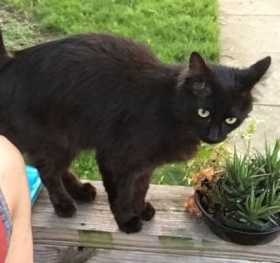 LAFAYETTE, INDIANA Last seen on Aug. 30th near Wildwood Place and Wildwood Drive. Tansy is a small (6-7 lbs. ), solid black cat with long fur and yellow eyes. She has a long, fluffy tail and should be wearing a flea collar (it may have come off) with a red, heart-shaped tag. She is usually very friendly to people and is much missed at home. Please call if you find her!! !